Pingdom compiled a chart that compares the historical pricing of hard disk drives and solid state disks. The data reveals SSD pricing has dropped rapidly in recent years, from an average of around $40 per gigabyte in 2007 to an average of $2.42 per gigabyte in 2011. Interestingly, the current average price per GB for a SSD is about the same as it was for a HDD in 2002, but the price difference between the two is still pretty large. The cheapest HDD in 2011 that Pingdom found cost $0.053 per GB, while the cheapest SSD had a price tag of $1.50 per GB, roughly 28x as much. 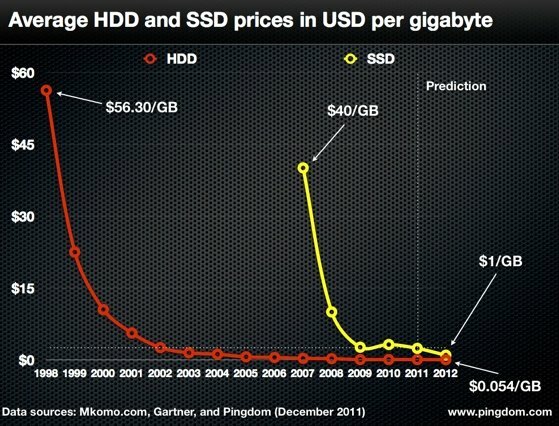 According to market research firm Gartner, SSD pricing should approach the $1 per GB mark in the second half of 2012. Breaking this barrier will be a major milestone but it also means SSDs will still be almost 20x more expensive than their mechanical counterparts. Looks like HDDs will remain the way to go to store lots and lots of data as SSD pricing is unlikely to match HDD pricing anytime soon. Additionally, HDD makers still have some tricks up their sleeves such as heat-assisted magnetic recording (HAMR), which is anticipated to enable future HDDs to store hundreds of terabytes. 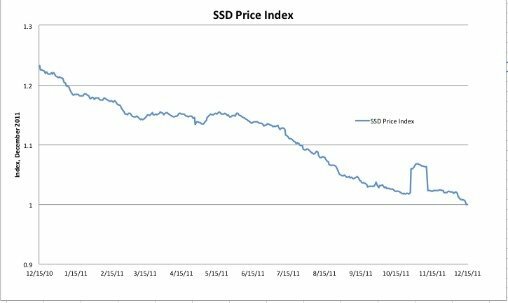 Recently HDD prices were rising pretty hard as global HDD production capacity was hit by major flooding in Thailand in October, but Computerworld reports pricing is slowly dropping again as HDD inventories are starting to rise again. IHS iSuppli market analyst Fang Zhang expects HDD supplies will hit their low point in Q1 2012, and anticipates pricing will begin to decline in the latter half of Q1 2012. HDD supply is expected to catch up with demand in Q3 2012, according to Zhang. According to new information from ecommerce tracking site Dynamite Data, the top 50 hard drives on sites such as Newegg.com and Tigerdirect.com, leaped in price by 50% to 150% after the flooding. The price jump was kicked off in October when drive inventory levels plummeted 90% in less than a week, according to Kristopher Kubicki, data architect at Dynamite Data. 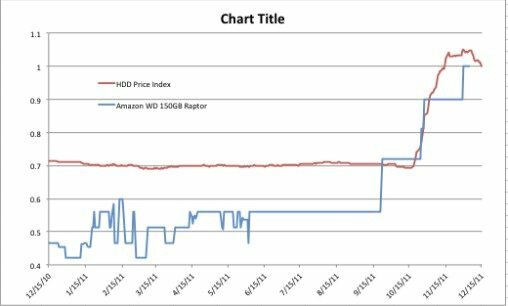 Copied below is a HDD inventory chart and a HDD price index, courtesy of Dynamite Data. Dynamite Data also compiled a detailed SSD Price Index that reveals pricing of SSDs fell by 23 percent over the past year. The price of SSDs dropped pretty steadily throughout the year, only in November the trend was broken briefly in the wake of the HDD supply crisis. If you have friends or family who are heavy downloaders you could perhaps go shopping for external hard drives or portable hard drives, these gifts are unlikely to end up on sites like eBay after the holidays are over!